The cascade of turquoise flowers grows to over a foot in length. The blue-green flowers bloom from spring through early summer. 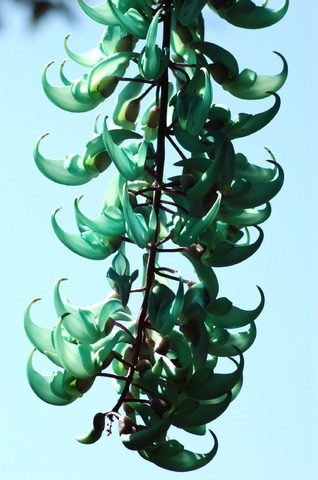 Blue jade vine is Native to the Philippines, and needs plenty of room to grow. Blooming begins when the trunk reaches ¾ inches in diameter. The woody vine itself has a thick trunk, branching out with evergreen leaves that are a waxy light green. A vine left untrimmed can grow up to 60 feet tall. The flowers of the Emerald Creeper are dramatically vivid. The stalk of flowers drops from the vine, can reach over 5 feet in length, and consists of 50 to 100 flowers. Each curved flower is 2 to 4 inches. The flowers are a beautiful turquoise color and sometimes used in lei making. Lighting: Full sun to partial shade. Benefits from direct sunlight. Temperature: Thrives in temperatures above 55° F (13° C). Humidity: Minimum humidity of 50% or higher; however, they will tolerate lower levels without harm. Watering: Allow soil surface to dry between watering. Saturate soil until a water runs out of the bottom of the pot. Fertilizer: Feed ½ tsp of fertilizer per gallon of water twice a month. Use a balanced fertilizer (15-15-15) or a blooming fertilizer (7-9-5). Pruning: The best time to prune Emerald Creepers is after the flowering cycle is complete. If pruned too early, the flowering will slow down. Propagation: Blue Jade Vine can be propagated from stem cuttings and by grafting. Propagate from an existing jade vine by taking cuttings of approximately nine inches long. Start them using a rooting hormone. Pests and Diseases: Possible pests include aphids, mites, mealy bugs and scale insects. At the first sign of infestation, use an insecticidal soap spray. Collecting Seeds: Allow pods to dry on the plant. Break open the pods to collect the seeds. Display Tips: Blue Jade Vines need support. They can be planted in a container, or near a trellis, a tree, or the side of a landscape structure (such as a garden shed). Note: When planted in a container, Blue Jade Vines are more likely to flower in a large container, exposed to as much light as possible. Strongylodon Macroboytrys can be propagated from stem cuttings, by grafting, or by germinating seeds. If you live in a tropical climate, these climbing vines are best planted in the ground near a trellis, tree, or the side of a landscape structure, such as a garden shed. In cooler climates, plant Jade Vines in a container for easy overwintering. Receives plenty of sun and humidity. Provides support such as a trellis, tree, or landscape structure. Add equal parts of vermiculite and shredded tree fern fiber to the germination flat. Space out jade vine seeds evenly on the surface of the germination flat. Press each seed down approximately 1/4 inch deep into the planting mixture. Cover the seed with a thin layer of the mixture. After watering the flat thoroughly, cover the surface with a sheet of plastic. To keep the soil warm and maintain the moisture level, secure the ends of the plastic to the bottom of the flat. Place the flat in location that does not receive direct sunlight. Growing mixture should never become completely dry. The seeds will germinate in approximately ten to fourteen days. When the seeds have sprouted, remove the plastic. Continue to keep the soil moist. Transplant the seedlings when they have passed their tender stage and have begun to crowd each other. Add a mixture of equal parts top soil, black sand and humus, along with a small amount of garden fertilizer to a small plant container. In the first few days after planting the seedlings, place the container in a shady, well protected area. Young plants are ready to be transplanted into their permanent home when they have become root bound. Be sure to provide support. Plant near a trellis, tree, or the side of a landscape structure, such as a garden shed. Ideal spacing is 12-15 ft. (3.6-4.7 m) apart. Add a small amount of fertilizer to the water you use for keeping the flat moist after seeds sprout. Be sure to water Blue Jade Plants during dry periods. Fertilize them twice a year with a general garden fertilizer.